Explanation: Does the Sun return to the same spot on the sky every day? No. A better and more visual answer to that question is an analemma, a composite image taken from the same spot at the same time over the course of a year. 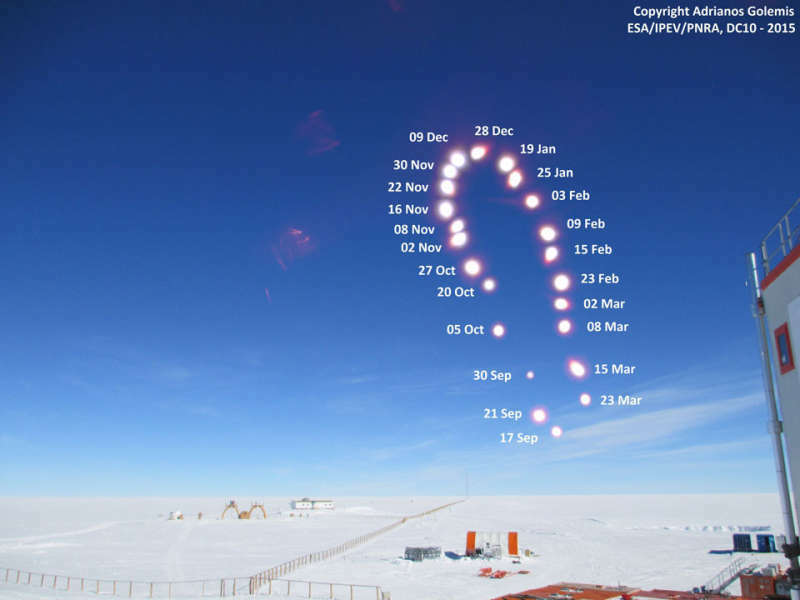 The featured weekly analemma was taken despite cold temperatures and high winds near the Concordia Station in Antarctica. The position of the Sun at 4 pm was captured on multiple days in the digital composite image, believed to be the first analemma constructed from Antarctica. The reason the image only shows the Sun from September to March is because the Sun was below the horizon for much of the rest of the year. In fact, today being an equinox, the Sun rises today at the South Pole after a six month absence and won't set again until the next equinox in March, baring large atmospheric refraction effects. Conversely, today the Sun sets at the North Pole after half a year of continuous daylight. For all of the Earth in between, though, the equinox means that today will have a nighttime and daytime that are both 12 hours long.